The Arrows Formula 1 team was established in November 1977 by a breakaway group of personnel from Don Nichols's Shadow team and some of their associates. The five founding members were Italian financier Franco Ambrosio (A), Alan Rees (R), Jackie Oliver (O), Dave Wass (W) and Tony Southgate (S). The team set up in headquarters at Milton Keynes and built the first Arrows F1 car in just 53 days. Arrows signed up Riccardo Patrese (also from Shadow) and Varig sponsorship was found for the car in Brazil where it finished tenth. Rolf Stommelen joined the team in South Africa, bringing Warsteiner beer money. Patrese led the race until his engine blew but he went on to score Arrows's first points at Long Beach in it's third race. Ambrosio soon disappeared from the team, being jailed for financial irregularities in Italy. And there was further trouble when Shadow sued for copyright infringement, claiming that the Arrows FA/1 was a straight copy of the Shadow DN9. While the case was going on Patrese finished second at the Swedish GP. The team, knowing that it would lose the case and not be able to race the FA/1, decided to build a new car called the A1. This was completed in 52 days and appeared the day after the High Court in London banned the team from racing the FA/1. At Monza in September Patrese was involved in the accident which claimed the life of Ronnie Peterson and he was banned from racing in America by his fellow drivers. Arrows finished the year ninth in the constructors' championship. The Warsteiner sponsorship continued in 1979 with Patrese being joined by Jochen Mass. Wass and Southgate revised the A1 but it was not very competitive and was replaced in June by the bullet-nosed A2. Arrows again finished ninth in the constructors' championship but in the Aurora AFX British F1 Championship Rupert Keegan won four races and the title with an FA/1 chassis run by Charles Clowes Racing. In 1980 the package remained the same although the A2 was replaced by the A3 which finished sixth on its debut in Brazil. Southgate left the team in the mid-season and in August Mass was injured when he rolled his car in Austria. Mike Thackwell and Manfred Winkelhock deputized but both failed to qualify. The team finished seventh in the constructors' championship. For 1981 Goodyear tyres quit F1 and Arrows signed up with Michelin. Patrese stayed and was joined by Siegfried Stohr with sponsorship from Beta Tools and Ragno. Patrese and the revised A3 took pole at Long Beach but retired after 24 laps. Patrese finished third in Brazil. The team switched from Michelin to Pirelli in mid-season. Jacques Villeneuve, brother of Gilles, replaced Stohr for the final two races, but failed to qualify for both. At the end of the season Patrese departed to join Brabham and was replaced by Marc Surer with Mauro Baldi being signed as his team-mate. Backing came from Ragno, Nordica and Autosonik. Wass designed the A4 but Surer crashed in South Africa and broke both ankles so Brian Henton stood in until the Swiss was able to drive again. The A4 was a disappointment and a new A5 appeared in August. Money was short in 1983 and Surer was joined by Brazilian Chico Serra. Former World Champion Alan Jones drove one of Wass's A6s at Long Beach but the team did not have the money to meet his financial demands. At the Belgian GP Thierry Boutsen arrived with sponsorship and Serra was dropped. Things improved in 1984 with BMW turbo engines and backing from cigarette company Barclay. Surer and Boutsen remained the drivers. The first Wass-designed A7 debuted in Belgium in April but Surer had to wait until July for his new car. The team failed to qualify either driver at Monaco but Boutsen scored five points and the team was ninth in the Constructors' Championship. The BMW influence was seen more in 1985 with Surer being replaced by Austrian Gerhard Berger. Barclay remained the sponsor and Wass's A8 was good enough to collect 14 points, including a second place for Boutsen at Imola. At the end of the year Berger moved on to Benetton and Boutsen was rejoined by Surer. The team retained Barclay and landed backing from American firm USF&G but the new season began with revised A8 chassis. Surer was badly hurt in a rallying crash in June and was replaced by BMW nominee Christian Danner. The A9 appeared in July but was a flop and Wass left the team. The new car was abandoned and Danner scored Arrows's only point of the year in Austria. At the end of the year Ross Brawn and seven of the design team from FORCE were recruited and work began on the new A10. BMW and Barclay withdrew at the end of the season but Megatron bought the rights to the engine and the team continued to use the rebadged turbos in 1987, with drivers Derek Warwick and Eddie Cheever. USF&G took over the whole car and the A10 scored 11 points to give the team sixth place in the Constructors' Championship. The package was retained in 1988 with the A10B collecting even more points. Warwick finished seventh in the World Championship and Arrows was fourth in the Constructors' title. Brawn produced the new A11 for 1989 and the team used Cosworth V8 engines for the new normally-aspirated formula. Warwick, Cheever and USF&G remained. The team finished seventh in the Constructors' Championship. In the course of the year the team unveiled its brand new US$10 million technical center but by the end of it Brawn, Cheever and Warwick had all departed. The team was then sold to Wataru Ohashi's Footwork corporation and John Wickham (formerly of the Spirit F1 team) and Yoshihiko Nagata were named directors. Oliver and Rees remained in management roles. It was too late to do much for the 1990 season and James Robinson's A11B, driven by Michele Alboreto and Alex Caffi, was not a success. The team, however, announced a major new deal to run Porsche V12 engines in 1991 and in June Alan Jenkins was signed up as technical director. Arrows was officially renamed Footwork for 1991. The season began with A11C chassis with Porsche engines but after neither driver qualified in Brazil there was a reshuffle with Rees being made financial director and Wickham named team manager. The prototype FA12 appeared but was then destroyed when its suspension failed in Tamburello Corner at Imola. Alboreto suffered a broken foot and Caffi damaged a second new car at Monaco. Alex was then hurt in a road accident and was replaced by Stefan Johansson. 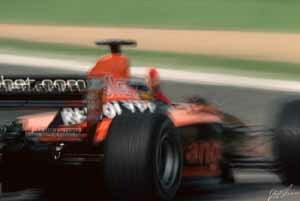 In June the team decided to replace the Porsche engines with Hart-prepared Cosworth DFR engines. Having failed to score points for a year the team was forced to pre-qualify and appeared only rarely in the second part of the year. Despite the problems the team opened a 40% windtunnel at Milton Keynes. The following year Caffi was dropped and Aguri Suzuki joined, bringing a supply of Mugen V10 engines. The FA13 chassis, designed by Jenkins, was a sensible car and Alboreto scored several times, the team finishing seventh in the Constructors' Championship. At the end of the year the Italian was dropped to make way for Warwick who joined Suzuki in 1993 with Mugen engines and a new FA14 chassis. It was a disappointing year, however, and at the end of the season Ohashi withdrew his sponsorship. The team lost its Mugen engines and had to return to Ford V8s. Jenkins designed the FA15 for young drivers Gianni Morbidelli and Christian Fittipaldi but money was short. Good reliability however resulted in several points finishes but at the end of the year there was a setback when Fittipaldi quit F1 for America. Wickham also departed. With an increasingly difficult financial situation the team picked pay-driver Taki Inoue to partner Morbidelli in the Jenkins-designed Arrows-Hart FA16. In the mid-season there was so little money that Morbidelli had to be replaced by Max Papis. At the end of the year Oliver and Rees bought back the shares from Ohashi thanks to assistance from finance house Schwabische Finanz & Unternehmensberatung AG. In March 1996 Tom Walkinshaw acquired a controlling interest in the team by buying out Rees. Tom controlled 40% of the shares with an associate Peter Darnbrough buying 11% and Oliver retaining 49%. In April the TWR F1 was launched and the team moved to TWR headquarters in Leafield, although the windtunnel remained in action at Milton Keynes. In September Walkinshaw signed up World Champion Damon Hill and hired wealthy Brazilian Pedro Diniz to help pay for Hill. The team announced a Yamaha engine deal and Bridgestone tires and Danka became the team's title sponsor. Jenkins left to join Stewart Grand Prix and Frank Dernie, who arrived with Walkinshaw from Ligier, took over as technical director. The Arrows-Yamaha A18 was launched in January but was not very competitive although, thanks to Bridgestone tyres and an improving Yamaha engine, Hill was able to dominate the Hungarian GP before mechanical gremlins slowed him in the final laps and he finished second. In the mid-season Walkinshaw hired John Barnard and the team recruited a completely new engineering staff. For 1998 Walkinshaw bought control of Brian Hart Ltd. and began to produce his own Arrows F1 engines. Hill departed and Diniz was joined by Mika Salo. It was not, however, a very successful package although both drivers scored at Monaco. There was another reorganization at the end of the season with Nigerian Prince Malik ado Ibrahim leading a consortium which acquired 60% of the team. Walkinshaw retained the rest. Malik disappeared from the scene after only a few months, leaving Walkinshaw in firm control again. For 2000 Walkinshaw managed to find backing from the Orange mobile telephone company and with Egbahl Hamidy designing and Supertec engines the team showed well in 2000 with Jos Verstappen and Pedro de la Rosa driving. A switch to Asiatech V10s in 2001 and the loss of a lot staff left the team rather weaker in 2001 when Walkinshaw decided to replace de la Rosa with F1 debutant Enrique Bernoldi. The team struggled through the season and Verstappen scored the team's only point in Austria. For 2002 Walkinshaw did a deal to use Cosworth V10 engines and retained Bernoldi (with support from Red Bull) but dropped Verstappen in favour of Heinz-Harald Frentzen who became available when Prost Grand Prix closed down. The team ran out of money in the midseason and failed to appear at all the races at the end of the year. As a result it went into liquidation at the end of the season.